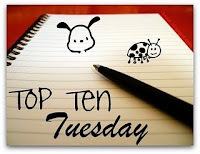 OK, so the problem with this Top Ten Tuesday is that there are SO MANY books I've had strong reactions to that it was hard to pick only ten, and I was taking way too much time trying to whittle it down. So believe it or not, I'm going to participate in this Top Ten Tuesday by NOT participating in this Top Ten Tuesday. I know, I'm being a punk, right? But I don't want to leave anyone out and I don't want to spend the whole day listing all the books I DID feel strong emotions over. I'm afraid it will make me riled up, aggravated, and/or sad for the rest of the day. On any given day, you will find me laughing, crying, yelling, or scratching my head over a book. I'm enjoying reading everyone else's responses on today's topic, but as for me, I'm pleading the fifth on this one. I know what you mean. It would be hard to single out any, and then there is the problem of what KIND of strong emotions did they elicit? One could probably have separate lists for sad, mad, happy, etc. !